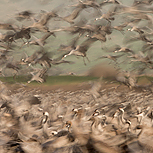 The Hula Valley which lies to the north of the Sea of Galilee is situated on one of the world’s most significant bird migration flyways, travelling between three continents. Every spring and autumn, hundreds of millions of birds pass through this narrow bottleneck; the most conspicuous being storks, pelicans and cranes as well as vast numbers of birds of prey. As in most other parts of the world, much of the original wetland in the valley was drained to make way for farmland, but in recent years a restoration programme has been taking place with its most notable success at the Agamon Hula Nature Park, creating an excellent working model for co-operation between nature, tourism and agriculture. 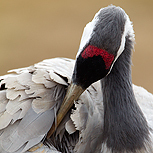 These days, anything up to 45,000 common cranes might spend the winter here, and the Crane Project exists to provide the birds with alternative food sources that don’t bring them into conflict with farmers, advised by the Society for the Protection of Nature in Israel. All of this amounts to a great opportunity for ecotourism, and the nature park has been quick to realise the potential, providing some excellent facilities for visitors such as the famous safari wagons that take you right into the midst of the crane flocks. For this trip we shall have exclusive use of our own safari wagon and tractor driver: to call it a mobile hide doesn’t quite do it justice – it’s more like an auditorium on wheels! Since the cranes are well used to seeing tractors and agricultural machinery, they’re not disturbed by the arrival of the safari wagon, but you’d never get near them on foot, or in any other kind of vehicle. There will be ample room for our group in the tiered seating, and reasonable space to set up your tripod. Although there’s no particular advantage to being in the front row, we will ensure that seats are rotated throughout the week, so that everybody gets a turn at the front. In the low light of early morning, you will need to be using some long exposures and this opens up an array of creative opportunities along with the quality light that follows. Please be aware that there will be other safari wagons in operation around the site, especially in the afternoons, as this fantastic spectacle is widely publicised and is very popular with Israelis. Other than the large flocks of cranes, you can expect to see other wetland bird species such as three species of kingfishers, glossy ibis, and the rare pygmy cormorant. Many birds of prey winter here, including lots of marsh harriers and black kite, plus a few greater spotted, white-tailed and imperial eagles. It’s quite common to see wild boar, and if you’re very lucky you might catch a glimpse of a jungle cat or golden jackal. Day 1: Upon our arrival at Israel’s Ben Gurion airport, near Tel Aviv, we will drive north to the Hula Valley, which should take no longer than three hours. We will then check in to our comfortable chalet accommodation at Nofey Gonen kibbutz guest house. If we look like arriving too late for an evening meal, we will stop to eat somewhere along the way. Day 2: We’ll enjoy a leisurely breakfast at Nofey Gonen, before getting acquainted with the Agamon Hula nature park just a few minutes’ drive away. In the afternoon, we’ll make our first excursion in the safari wagon to view the cranes. Expect some close encounters! Day 3: Early morning start, so that we can be on site at Agamon Hula before the cranes start to leave their night time roost. We’ll return to Gonen for a late breakfast. In the afternoon, we may visit the nearby Ha Hula national nature reserve, the oldest remnant of this once great wetland. The papyrus swamp here is home to re-introduced water buffalo. Day 4: Another early morning start and dawn excursion in the safari wagon. Later on, we’ll make a club car tour of the Agamon, stopping off to photograph other wetland birds, and the landscape. At dusk, we’ll try to get into a good position to photograph the cranes gathering and flying in to their night time roost. Day 5: Possible visit to Gamla nature reserve, for griffon vultures. There’s also a good chance of seeing/photographing Bonelli’s eagle here. In the afternoon, we’ll be back in the safari wagon at Agamon Hula for more crane activity. Day 6: Our final morning of crane photography, from the safari wagon. Day 7: Check out of our accommodation and drive to Ben Gurion airport, in time for our return flight to the UK. We will be staying in a small and comfortable guest hotel with breakfast and dinner supplemented by a packed lunch. Rooms are on a shared basis, but single supplements are possible on request.